We would like to remind all the students who reached the next stage of WSZOP Competition to do the test. Deadline is TODAY !!! It is the most important Polish National Holiday. Polish Independence Day is celebrated to commemorate 11th November 1918. On that day Poland regained independence after 123 years. The partition of Poland which lasted for many years was conducted by Austria, Prussia and Russia during 1772-1795. The Poles have never given up fighting for independence. After many uprising (November uprising in 1830 and January uprising) they have finally regained independence owing to their bravery and patriotism. Polish Field Marshall Józef Piłsudski has played a major role in this event. 11th November has been celebrated as commemoration day since 1920, but became a National Holiday in 1937. Then from 1938 until 1989 during the communist regime it was forbidden to celebrate it. After the fall of the communist regime it gained a special meaning and it is a Public Holiday. The National Independence Day is a special day for all Polish people. The main celebration ceremony takes place in Warsaw on Józef Piłsudski square. The President of Poland, Prime Minister and many MPS take part in the celebration. There is a solemn change of guards at the Unknown Soldier’s Tomb, which takes place at noon. The ceremony of Polish Independence Day took place in our High School on 8th November. The teachers responsible were: Mrs Agata Warta and Ms Agnieszka Warzecha. This year’s ceremony was very important because it was 95th anniversary of Polish Independence. The whole celebration had an elevated character. It was very important for us to do our best to show other students the most important things from the history of Poland from 1795 until 1918. What’s more, at the end of our ceremony we commemorated Tadeusz Mazowiecki, the first prime minister of free Poland. To sum up, we think that this day is one of the most important days for our country and we should honour it every year in our High School, also in such a ceremonial way. Have a look at a few photos taken by Olga Głowacka from 2b and Martyna Tyras from 2f. Remembrance Day (also known as Poppy Day) is a memorial day celebrated on 11th November in Commonwealth countries since the end of World War I to remember the members of their armed forces who have died in the line of duty. The World War I formally ended “at the 11th hour of the 11th day of the 11th month”. The red remembrance poppy has become a familiar emblem of Remembrance Day due to the poem “In Flanders Fields”. These poppies bloomed across some of the worst battlefields of Flanders in World War I, their brilliant red colour an appropriate symbol for the blood spilled in the war. When it comes to holidays and special occasions that take place in UK in November, there is one called GUY FAWKES NIGHT. 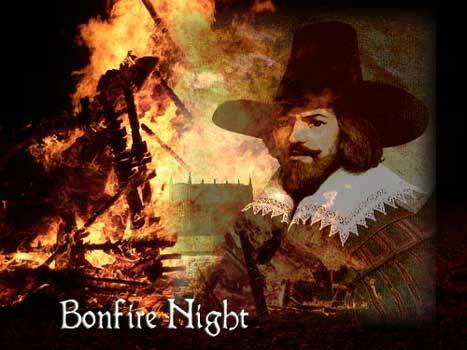 Guy Fawkes Night is an English folk festival celebrated on 5th November. It commemorates an attempt to blow up the Parliament in 1604 by Guy Fawkes. He was the Catholic conspirator who was caught red-handed. Traditionally, on the anniversary of this event are burned effigies of Guy Fawkes – the “guys” and there are fireworks, too. The guys are made by children who try to collect money by asking passers-by to give them “a penny for the guy”. The largest event held in England on this occasion is a carnival located in Bridgewater on the first Friday in November.